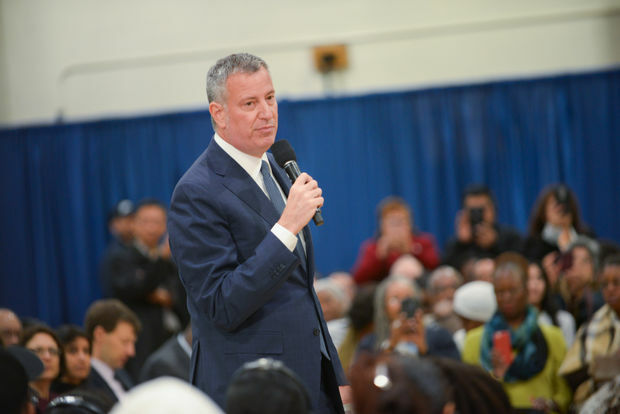 Mayor Bill de Blasio announced work on 111th Street should begin this summer. NEW YORK CITY — Mayor Bill de Blasio sailed to victory in Tuesday's Democratic primary, easily defeating his challengers to move on to the general election in November. The incumbent mayor won with 74 percent of the more than 423,000 votes, with 98 percent of the votes tallied, according to Board of Elections data. At his victory party, de Blasio, continuing with his campaign theme of building a city for everyone, thanked New Yorkers for the victory. "My friends, it is so wonderful to be here to celebrate a resounding victory tonight. Every one of you made a difference," the mayor tweeted once he was announced the winner. He continued with his theme of building a city for everyone — telling New Yorkers there was still a lot more work for him to do. I do not accept the status quo in this city. We have more to do. I am not going to stop until we build that fairer city — for everyone. Thank you, NYC! Next up, the general election on November 7. Let’s continue to make this your city. Former City Councilman Sal Albanese, the only candidate de Blasio publicly debated before the election, received more than 65,400 votes, or 15 percent — more than ten times as many votes as he received when he ran in 2013. Michael Tolkin received more than 20,000, or 4.7 percent of the votes. Robert Gangi and Richard Bashner each received less than 4 percent of the votes, data shows. De Blasio next takes on Assemblywoman Nicole Malliotakis, a Republican from Staten Island, as well as former police officer turned private investigator Bo Dietl​ — who is running on his own "Dump de Blasio" line — in the Nov. 7 general election. Albanese will also be on the ballot as the Reform Party candidate.